Along with other abbots he was invited to and participated in the Seventh Ecumenical Synod in Nicaea. 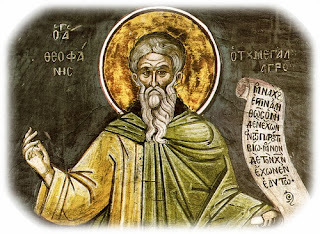 After his return he settled in the Monastery of Sigriane another abbot, and he established a new and bigger monastery for his numerous disciples. Along with his duties as abbot he occupied himself with writing and calligraphy. Six years later he was exiled by the iconoclasts to Samothrace, where he completed his earthly life in 815. Later his disciple transferred his sacred relics to the monastery where he lived the last years of his life. 1. "By thy virtuous life, O righteous Theophanes, thou didst serve God Who was made manifest in the flesh for our sake." The true worship of the Triune God is connected with a holy and virtuous life, which is the harmonization of the life and state of being of man in accordance with the will of God. With obedience to all the divine commandments the heart is purified of the passions, people are humbled, and the nous is illumined and sees the glory of God. "Blessed are the pure in heart, for they shall see God." God does not ask for money from people, nor land and other tangible goods, but asks for their heart to be purified that He may dwell within it and change it into His temple, in which true spiritual worship will be continuously performed. Through the mouth of the Prophet Hosea, God says that "these people honor Me with their lips, while their hearts are far from Me", and this is why no matter how loudly we cry out we will not be heard. When the Prophet Moses prayed, although he did not move his lips, his prayer had such power and intensity that God heard it as a loud cry. And he was heard, because his way of life was pleasing to God, his heart was totally given to God and he prayed deeply. Living the ascetic way of life as taught by the Orthodox Church helps in the concentration of the mind of man in prayer and worship, which is used to wandering and being captivated by images and thoughts of persons and things. Our attendance in church from early morning, when the Service of Matins begins, gives us the opportunity to enjoy the wonderful hymns on Sundays or certain Feasts, and these sweeten the heart and help concentrate the mind better during the Divine Liturgy. 2. "...thou didst illumine the ends of the world." When the heart is purified from the passions and illumines the nous, then our entire human existence becomes light and "illumines the ends of the world". Man then radiates the light of Divine Grace with his words and deeds and becomes useful to all, even to unreasonable creation. He comforts the afflicted, feeds the poor, supports those who are ready to collapse from the weight of their misfortune and variety of problems, and does not destroy creation, but instead loves and cares for it. The people of God are truly the best environmentalists. But when someone, because of pride and other passions, does not allow the uncreated energies of God to enter their existence, then the created energy of the devil enters. Because when the devil sees the heart empty of Divine Grace, he comes and darkens the nous and dominates people. "What does the Grace of God have to do with pride? God is humility. And when the Grace of God departs, the devil comes and makes a person dizzy. Then they can be influenced by demons externally and within have a dark spirit" (Elder Paisios the Athonite). Therefore, as Metropolitan Hierotheos of Nafpaktos often emphasizes, there are two categories of people in society: those who have the Holy Spirit, who are truly people of the Spirit, and those who do not have the Holy Spirit and, therefore, are dominated by an evil spirit. "Whoever has God in their heart does not leave anybody outside of their heart", and this is why he is always pleased to offer and be offered. Source: Ekklesiastiki Paremvasi, "ΟΣΙΟΣ ΘΕΟΦΑΝΗΣ Ο ΟΜΟΛΟΓΗΤΗΣ", February 2005. Translated by John Sanidopoulos.